In 1993, Sensible Software released a special version of their popular football game Sensible Soccer called unSensible Soccer. Given away free on Amiga Magazine coverdisks at the time, unSensible Soccer was one of the finest moments in fruit related game history because it allowed the player to stage a game of football between teams of apples and oranges, with pears for goalkeepers! Everyone knows that the review score of any game can be increased by 10% immediately by the inclusion of FRUITZ, so this magnificent triumph of gaming was so good it challenged conventional mathematics by obtaining theoretical review scores of 106%. 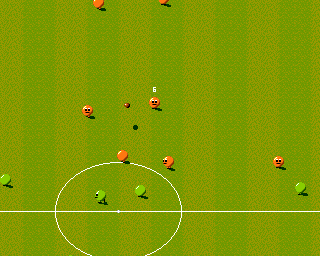 Unfortunately, the option to play as fruit was not featured in the recent XBLA release of Sensible Soccer, the developers choosing instead to add an unnecessary concentric circle screen ripple on scoring a goal. There are plenty of places on the internets that are content with celebrating homely, blitz-basic style rudimentary hardware effects in games, but this ain’t one of them. Round these parts, we like FRUITZ.